With mobile phones being our most utilized (and often most loved) possession, it only makes sense to accessorize them. What better way to accessorize a phone than with your own personal message? We offer phone cases for a range of different model types for both Apple and Samsung phones. 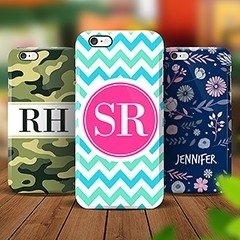 Our intelligent web designer allows you to customise a phone case in a matter of seconds. You have plenty of stunning designs to choose from, once you’ve picked out a phone case you admire, simply select it and start customising. 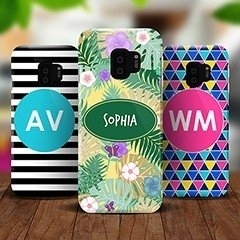 You can customise a phone case to boast a set of initials or an entire name. Or, if you are feeling particularly adventurous, you can embed a particular word that means a lot to you. Each of our phone cases are made from a durable scratch resistant plastic that will, not only protect your phone if you drop it, but also retain their stunning looks regardless of daily usage. Our highly specialised printing machines ensure that all our designs are protected from fading, so colours will remain fun and vibrant. Once the designs have been submitted, you can receive them in one of two ways: Absolutely FREE – Come pick it up from the store, we’ll email you when it’s ready! Mail Delivery – we offer both standard and express delivery options Have the perfect custom design in mind? Start designing today!